Scientists uncover a way to control terahertz radiation using tiny engineered particles in a magnetic field, potentially opening the doors for better medical and environmental sensors. For years, scientists have dismissed terahertz radiation. Why? There were few ways to control this line-of-sight, nonionizing radiation. However, they saw its potential. For example, it could be used for short-range, high-bandwidth communications for tiny medical and environmental sensors. 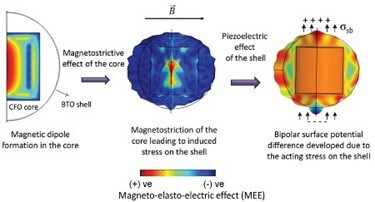 Now, researchers have developed a way to magnetically control terahertz beams using specially designed nanoparticles. By controlling the strength and direction of the applied magnetic field, the nanoparticles dynamically tuned a terahertz beam’s phase and amplitude. This study shows the potential for engineered nanoparticles to magnetically control terahertz beams. Controlling the amplitude and phase of the beams at the nanoscale offers a range of possibilities. For example, the nanoparticles could enable tiny, high frequency transistors. The particles could also help create wireless networks that let nanorobots work together. The terahertz spectral window (100 gigahertz to 10 terahertz) is attracting attention for its potential use in submillimeter-wave communication and sensing systems. While there is still much to be learned about this spectral band, nanostructures will likely play a significant role in the development of future terahertz systems for real-world applications. Using advanced electronic materials that simultaneously possess both magnetism and ferroelectricity, researchers from the University of Texas at San Antonio and the Center for Integrated Nanotechnologies demonstrated magnetic control of a terahertz beam. The team used a hydrothermal method to synthesize nanoparticles composed of a ferromagnetic core (cobalt ferrite) and a ferroelectric shell (barium titanate). Assemblies of these nanoparticles were then operated under the influence of an external magnetic field and at a low temperature. The team varied whether they applied the magnetic field parallel or antiparallel to the direction of a terahertz beam. They observed different effects for the two magnetic field orientations. When applied antiparallel to the terahertz beam, the nanoparticle assembly modulated the amplitude of the transmitted terahertz beam. When applied parallel, the nanoparticle assembly modulated the phase of the terahertz beam. These effects are due to the different types of magnetic and electric coupling that occurs between the ferromagnetic core and ferroelectric shell of the nanoparticles. This research uncovers an exciting new approach for the dynamic control of terahertz wave propagation by way of nanoparticles. It demonstrates a terahertz mode-switch where the mode of modulation–amplitude or phase–can be dynamically switched by changing the direction of the applied external magnetic field. This work has been supported by the National Science Foundation and by the Department of Defense. The terahertz measurements were performed at the Center for Integrated Nanotechnologies, an Office of Science user facility operated for the Department of Energy (DOE) Office of Science. Los Alamos National Laboratory is operated by Los Alamos National Security, LLC, for the National Nuclear Security Administration of DOE. The transmission electron microscope has been made available by the National Institute on Minority Health and Health Disparities of the National Institutes of Health.